Summary: In this very long interview originally posted on March 1, 2011, producer Eshiro and director Yamazaki talk about Gyakuten Kenji 2 ('Turnabout Prosecutor 2'), which was released just a few weeks earlier. Basically everything about the game is discussed: from the early stages of development, to how the story was written, how they came up with the new game mechanics, how they thought of new characters, and decided to use old characters and the music design. 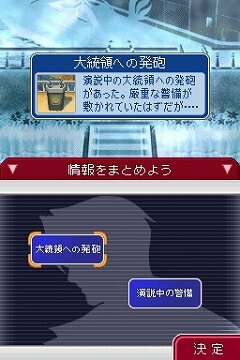 They also talk about topics outside of the game, for example about how Eshiro organized the marketing campaign for this game, with many elements from this game's promotion also being used later for Gyakuten Saiban 5 and 6 (Dual Destinies and Spirit of Justice). All in all, this is probably the deepest interview regarding making and promoting the game. 4Gamer: Thank you for today’s interview. 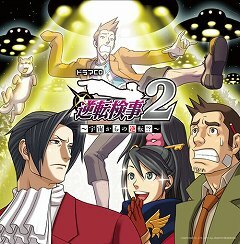 Gyakuten Kenji 2 was released about one year and nine months after Gyakuten Kenji (1). Could you tell us about how the project got started and how it was developed? 4Gamer: When did you actually start with development? 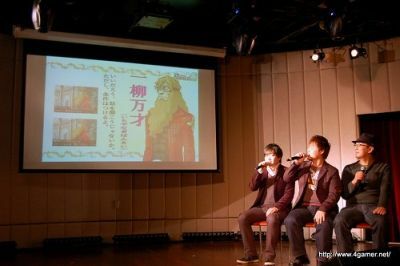 Eshiro: We announced Gyakuten Kenji 2 just before Tokyo Game Show 2010, but the project started about one year earlier. We got time for the preparation and started with outlining the scenario…. But the road from there was still long (laugh). 4Gamer: Mr. Yamazaki worked on the scenario once again, but in the interview about the previous game, he said: “I’ve given it my all.” Was it difficult to come up with the scenario for the sequel in such a state? Eshiro: You’ll always have the feeling you left things undone after a release. When you actually play the game, you’ll go: “I should’ve changed this to be more like so”, or “I had a different idea for that”, and those feelings piling up becomes the motivation for the next game. Even if you used up 100% of what you’ve got then, creators will always feel like working on a next game. 4Gamer: How was the reaction when you announced Gyakuten Kenji 2 at Tokyo Game Show 2010? 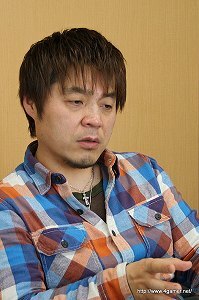 Eshiro: Before the announcement, rumors had been going around that “the sequel was coming” and “it’s about time they’ll announce something.” We had announced the game in Dengeki one week before the Tokyo Game Show, and we went to the show with a playable demo, so the fans reacted very enthusiastically. For Gyakuten Kenji 1, we had 24 demo machines, but we had upped that to 40 machines this time, but even then we had to put a limit on the number of guests to the booth. That many people came to play the game. We also had other things like life-sized figure of Mitsurugi (Miles Edgeworth). 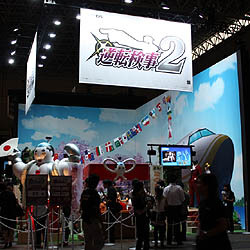 4Gamer: Now you mention that, at Tokyo Game Show 2010, you had a recreation of Hyōtan Lake Park (Gourd Lake Park). Eshiro: We always try to make a booth to match up with the demo, but the Gyakuten series can be quite crazy sometimes, so recreating that is quite difficult (laugh). 4Gamer: Now that we’ve played the game and look back, I have to say that I’m impressed by what you made, like the Tonosaman (the Steel Samurai) balloon. Eshiro: We had many meetings to recreate Hyōtan Lake Park, but if you think about it, it’s kinda crazy (laugh). 4Gamer: Was it planned to keep the announcement under wrap until Tokyo Game Show 2010? Eshiro: Yes. With the first Gyakuten Kenji, the period between the announcement and the release was long, and the fans’ excitement cooled down a bit. This time, we went for a promotion schedule that presented a lot of information in a short period of time to the fans. We announce all kinds of new things after another, so the expectation level of the users won’t drop, and we had all kinds of events from the announcement until the release. Because of that, we managed to have the release right when expectations were at its height. 4Gamer: What did you pay most attention to when you made Gyakuten Kenji 2? Yamazaki: For the scenario, it was important that no matter what we did, we didn’t stray from the world of the Gyakuten series. In terms of game mechanics, it was almost perfect in Gyakuten Kenji 1, so we basically took the foundation from the previous game, and considered what new elements we could add. Originally, the concept behind Gyakuten Kenji was that the player would become and play as Mitsurugi, so a Mitsurugi simulator game. So to push that concept further, we thought about a scenario that fitted Mitsurugi, and game mechanics that could allow you fight like Mitsurugi. 4gamer: What is the central theme of the game? 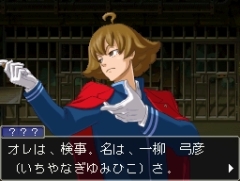 Yamazaki: “Let’s write about Mitsurugi.” In the first game, Ichijō Mikumo (Kay Faraday) was the central character, and Mitsurugi solved the problems that befell them, so his position was like that of a detective. But to really have people experience what it is to be Mitsurugi, we needed to write a story that was about Mitsurugi, so we came up with the theme of “Mitsurugi in conflict.” Mitsurugi is a prosecutor now, but long ago, he was actually hoping to become a defense attorney just like his father whom he looked up to. 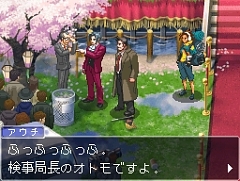 Because of the appearance of a certain defense attorney, Mitsurugi is thrown into an internal conflict about whether he should proceed living as a prosecutor, or whether he should live as a defense attorney. This is what we first came up with. We also wanted to portray the two Mitsurugis: father Shin and son Reiji, and by having all kinds of parents and children in the game, we’re portraying the theme of parents and child. 4Gamer: Why was Gyakuten Kenji 2 set chronologically so close to the first game, just about one week later? Yamazaki: In the last game, we aimed at creating a sense of speed by having the cases in the game happen in about one week. That worked, so right from the start we decided we would basically follow that formula. Also, we thought that the sense of speed would be better if we didn’t leave too much time open between the two games. 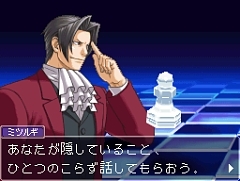 And Mitsurugi is a very talented prosecutor, who is busy every day. You can really experience being as busy as Mitsurugi, by having all kinds of things happen in a short span of time. 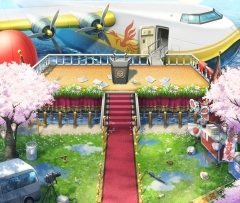 4Gamer: How did you decide to make Hyōtan Lake Park the setting of the first episode? Yamazaki: Actually, it had not been our idea from the start to use Hyōtan Lake Park. We first made Episode 2, and when we thought hard about what to do with Episode 1, we thought that like with the first game, we needed the case to happen in a place that had ties to Mitsurugi. 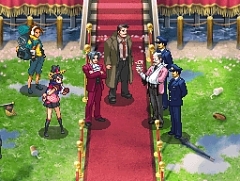 That’s how we arrived at Hyōtan Lake Park, where Mitsurugi got involved with a case in Gyakuten Saiban (Ace Attorney 1). So episode 1 was actually made because of the location. 4Gamer: So you don’t make the episodes in order starting with Episode 1? Yamazaki: Precisely. We first decide on the outline of the complete game, and then make the individual episodes. This time we started with Episode 2, because the important characters like Mikagami, Ichiyanagi and Shigaraki appear there. We first had to get a good grasp on their characters first. 4Gamer: By the way, how long does it take to complete the whole scenario? Eshiro: We work on the scenario until the very last. During development, nothing is finished in order of appearance in the game, from the character designs to elements besides the story. And it often happens that when we put it in the game, it doesn’t work well, and sometimes have to give up on something. Then we have to rewrite the whole scenario. Yamazaki: We usually decide on the bigger outlines of what we want to do in the first month, or two months. But it takes to decide on the details of each episode, and sometimes, it even takes more than one year. Eshiro: It’s an adventure game, so system-wise, it is not as complex as other games, but in return, it takes a lot of time to get the scenario done and work on the presentation to get it as effective as possible. So it just never happens that once a scenario is done, it’s made into a game and we’re done. If we change one thing, we need to review it the complete structure again and sometimes, the whole game has to change. 4Gamer: Could you be more specifica bout what you need to look over again? Yamazaki: For example, a story development might work in a novel, but when it’s put in a game, it might not be able to keep the player excited. In that case, we need to look over the story structure again and try changing it, and sometimes even get rid of it. The Difficulty Of Adding New Elements While Keeping The Gyakuten-ness. And The Many Fights That Happen Because Of That. 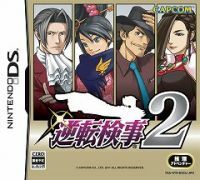 4Gamer: Gyakuten Kenji 2 made quite an impression with its turnabout situations followed by more turnabout situations, right from the start. Yamazaki: I just want to turn things around (laugh). Eshiro: Yamazaki can’t right straightforward stuff, his scenarios always have to turn around (laugh). 4Gamer: While playing the game, I even got worried about how it would work out in the end. Eshiro: It’s a game where you should enjoy the story developments, so in a way, we need to betray the expectations of the users, in a good way. Yamazaki: I like to focus on how to present a surprise. In a way, that’s why I want to add as much of turnabout situations as I can. Eshiro: Surprises aren’t only found in the scenario, but also in the character designs and the animations, and that’s really thanks to the talents of Yamazaki here and the designer, Mr. Iwamoto. And of course, the power of the music by Mr. Iwadare is also important. Silent scenes, thrilling scenes: it’s really completely different if there’s no music. 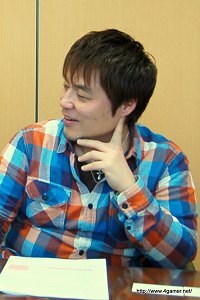 4Gamer: In a way, Gyakuten Kenji worked because Gyakuten Saiban existed before that, but do you feel difficulties there? Eshiro: There are a lot of fans of the Gyakuten series, and among them, many of them love the characters. Talking from the point of view of the producer, I want to handle these characters very carefully, so their taste isn’t lost, but I also want to make sure they aren’t only understandable for insiders. It’s bad if new players don’t get anything of it, and only people who already knew the series can enjoy it, so that balance is important, but very difficult. Yamazaki: “We can’t destroy Takumi Shū’s Gyakuten World”. That is our premise, but on the other hand, we can’t do anything to deepen the experience if we keep on thinking: “Only the things Takumi Shū did matter.” So it is really difficult to strike a good balance between that. Most of the Gyakuten world was created by Takumi Shū on his own, so the rules of that world really depend on him. Of course, it’s not like they are set in stone, but the point is recognizing them and building on them. When we want to add something new, we also pay attention if it fits in the world that’s there already and see if it doesn’t go against it. 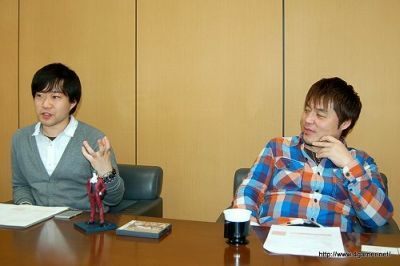 4Gamer: How many of the members in the development team of Gyakuten Kenji 2 have experience on working on the series? 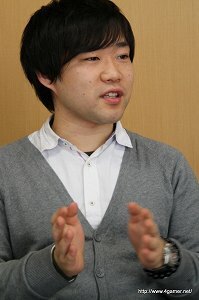 Eshiro: At the peak, we had about 40 people, and about two-thirds of them already worked on the series. Yamazaki: Sometimes new members will point out during development that this or that part of the series is weird. But people who have worked on the series for a while now, they might think: “It’s not really a Gyakuten game without that.” That’s when we have deep discussions and see where we end up. 4Gamer: On the blog or at events, you always talk about how the two of you always get in each other’s hair. How much of that is true? Eshiro: More than 80% of that is non-fiction (laugh). It’s been dramatized little so it works as a comic, but besides that, it’s all real. 4Gamer: What do you argue about? 4Gamer: It is hard to decide when something becomes a spoiler for an adventure game. Eshiro: Also, the characters are one of the highlights of the Gyakuten series. With pre-release information, we can have the users get all hyped up about what that character will do, and in the game, we try to betray their expectations in a good way. That is effective too. But of course, we can’t just go announce everything, so I try to manage it while keeping the development team’s wishes in mind. Yamazaki: We of the development team of course understand we need to give information. But our position is different, so we draw the lines at different places. So we try to defend that. But in the end, Mr. Eshiro never backs down, so I always think: “That guy never takes a step back…” (laugh). Eshiro: It was like that with Ichiyanagi Bansai we announced at the complete reveal presentation. Yamazaki: That was really just right. Just right across the other side of the line (laugh). 4Gamer: Could you tell us about how you implemented the “Logic Chess” mechanics? Yamazaki: It was the result of wanting to show more Mitsurugi-ness. 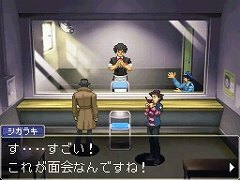 In Gyakuten Kenji, we introduced the Logic system in the Investigation parts, but we simply used the system from Gyakuten Saiban in the Confrontation parts. 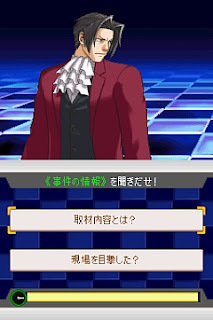 We wanted to have something where Mitsurugi would be the one asking probing questions, and where he’d get testimony from the opponent. Eshiro: The first time Yamazaki explained me about this, I didn’t understand it all. He explained it to me like he just did to you, and then said “A mechanic like that would be fun, right?” When I asked him about what the mechanic precisely was, he answered: “I don’t know yet.” (laugh). But if we’re going to make Gyakuten Kenji 2, we’d also need some new mechanic. We first got a good grasp on the idea of when the players read the situation correctly and ask a question, what would the merit and fun would be of that, and in return what would be at risk. 4Gamer: How hard was it to get it in its final form? Eshiro: If we did this wrong, it’s just become a “try-all-options” thing, so we had troubles getting it working right within the game. The Gyakuten series is known for “being simple in controls, but being deep in story”. We can’t have difficult controls, so there were a lot of ideas in the start we had to scratch, but we continued working on it, and it didn’t take long to find the right direction we wanted to go in. Our staff members are professionals, so the system kept getting better and better. 4Gamer: Adding a time limit in Logic Chess is a first I think. 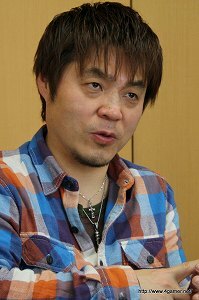 Eshiro: “Adventures should be played slowly and thoroughly” was the idea, so originally, the Gyakuten series was not to feature have any time limits. The reason why we implemented it in Logic Chess was not to put a restriction on the users, but because we figured that it would give them a good sense of pressure. I think the team’s hard work has resulted in a perfectly balanced system. I think it’s a good system that gives the user the perfect amount of tension. No matter how often you fail, if you do your best, you should be able to complete it. 4Gamer: So Logic is static, and Logic Chess is dynamic. Yamazaki: Yes. So I think that shows off Mitsurugi. Eshiro: Also, we figured that by adding Logic Chess as a new big hurdle in the game flow, we could give more depth to the Confrontation parts that follow up. Logic Chess changes the pace of the game, and we added them where we figured it would work best in terms of the presentation of the story flow. 4Gamer: That’s why sometimes I’d think that a Logic Chess part would come, only to be wrong. 4Gamer: You reworked all of the mini-character sprites for this game, right? Yamazaki: Yes. Because Eshiro came with the ridiculous order of “I want you make a game that is a power-up of every aspect of the previous game”. Eshiro: I myself thought it was a ridiculous order (laugh). Yamazaki: So that’s why we thought he needed to remake all of them. At first Eshiro was also hesitant, but when we compared the new ones we had drawn for a test with the older ones, the newer sprites looked much better. So that’s why we decided to redo everything. We changed the animations, and we also upgraded the quality of the backgrounds. Eshiro: The ROM is the same size as that of Gyakuten Kenji (1), but in terms of presentation, we have much more expressions overall compared to the first game. We even have mini-characters and animations we only use once in the whole game. 4Gamer: Gyakuten Kenji 2 has pretty nice scenes where the presentation hooks up very well with the music, I think. Yamazaki: Mr. Iwadare made fifty tracks for Gyakuten Kenji 2. They’re all good, and really makes you appreciate Mr. Iwadare. 4Gamer: Was it difficult putting the music in the game? Yamazaki: We had Mr. Iwadare compose the music to match the scenes and characters, so none of the tracks differed completely from our own image. All the songs were precisely what we wanted, so there was no problem there. But we had trouble with the music for Logic Chess. That part is played in a special space and on the screen it looks “static”, with a lot of blue. So the first song Mr. Iwadare sent to us was a very silent song. But in reality, Mitsurugi is having a heated battle in his mind, so we had to make a new, slightly difficult order of a song that raised the fighting spirit, but which would also match with the graphics. 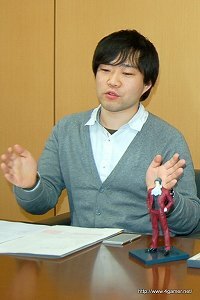 Yamazaki: What’s difficult about the music for the Gyakuten series is that in for example the Confrontation parts, we have testimony parts, parts where the deduction has gone a bit further, and finally the pressing climax, so you need songs in stages, each with a different pace and sense of tension. In a normal track, you’d have all those stages within that one track, but in the Gyakuten series, we show all those different stages of tension and match that with the music, so it’s actually best when each separate track doesn’t have too much variety in tension. Mr. Iwadare told me it was quite difficult at first to get used to that. 4Gamer: The Gyakuten Kenji 2 tracks are easy to get used to when you’re playing the game, but when I try to remember them, they just don’t come out. They don’t really stand out. Eshiro: We did that on purpose. When asked what makes a game good, I think in the end, it comes down to that nothing feels ‘off’ anymore. We got feedback saying people felt something was ‘off’ about all kinds of things in the last game, like the story gimmicks, the controls and how the story went. But we heard very little about that about the second game, and hear often: “I just want to keep on playing.” I think that’s the result of us working on an immersive play experience, from the animation of the mini-characters to the tricks, sound and everything else. Eshiro: We worked on each and every comment we got through the company quality team, and our idea was not to break and get rid off the things that stuck out, but to work on smoothing out the rough places. As a result, I think we’ve got a game that might not be perfectly even, but it has no things sticking out and feels nice overall. Characters: The Highlight Of The Gyakuten Series. How Do They Pay Attention To Using And Naming Them? 4Gamer: In Gyakuten Kenji 2 there are both characters who return from the first game, but also who came from older Gyakuten games. How did you choose them? Yamazaki: Well, it was quickly decided we’d have Ichijō Mikumo appear again, as she is the heroine. As for Rō Shiryū (Lang Shi-Long), we didn’t manage to explain why he hated prosecutors, so we wanted to take on that challenge wit this game. And the Gyakuten series is of course also made for the Gyakuten series, so for each episode we think about who we might use. While we’re making the scenario, we use characters we think that could really fit perfectly in the story. Eshiro: It wouldn’t feel good if we’d just forced the characters in the game. We try to have them appear naturally in the game.”This is the story, so this character would be nice for this scene.” For this game, Yamano Hoshio (Frank Sahwit) fitted the bill for example. 4Gamer: By the way, it was not explained he was a character from a previous game. Yamazaki: We don’t want to spoil the series, so we try not to talk about the past. 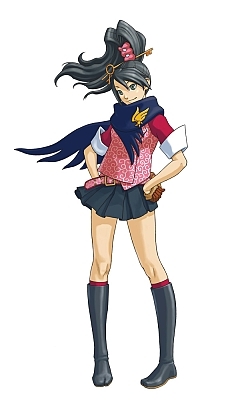 They are also people who started with Gyakuten Kenji and then moved on to play Gyakuten Saiban. Eshiro: Once you start to talk about the past, it’s easy to get stuck to inside jokes. Starting “It’s been so long ago” might be fun for the fans, but it’s like you’re just leaving behind the users who’re playing this for the first time. They’ll lose immersion then. Yamazaki: That is why we only vaguely hint at the past of these characters. People who don’t know them, will just read over that, while people who do know them, can get a little smile out of it. Eshiro: They might also want to replay the Gyakuten series again. Actually, I was happy to hear people say they were going to replay all of Gyakuten Saiban again. 4Gamer: Was that also noticeable in sales numbers? Eshiro: The sales numbers of the Best Price! versions (TN: Budget re-releases) of the Gyakuten Saiban series did really improve when Gyakuten Kenji (1) was released. We don’t have the data for the new game, but I heard people also bought the Best Price! version of Gyakuten Kenji (1) together with Gyakuten Kenji 2, so I think it’s stimulating. 4Gamer: It’s hard to get motivated to replay an adventure game once you’ve seen the ending, so did you work on that for Gyakuten Kenji 2? Yamazaki: Actually, many users replay the Gyakuten series several times. It’s often replayed. We have prepared places you can examine besides the necessary spots, so we have things there so you can enjoy it in all kinds of ways. I think it’d be nice if users would follow the story in their first playthrough, and then take the long way and pick up on the little jokes on their second playthrough. Eshiro: We also prepared several things so people can enjoy multiple playthroughs, like multiple patterns to when you fail a “Present”, and the text volume of the final game is really amazing (laugh). Yamazaki: We even had to prepare dialogues between characters for when you examine a cup of tea (laugh). I really hope the users can appreciate that. 4Gamer: It’s almost a traditional art that there are rules and characteristics to the naming of the characters of the Gyakuten series. Could you tell us about that.. For example, does the name Shigaraki Tateyuki come from a Shigaraki Tanuki? Yamazaki: Shigaraki is the partner of Mitsurugi Shin (Gregory Edgeworth), so we wanted to have the same character in their names: shin. From there, we matched shin (‘believe’) with tanoshii (‘fun’), so read together that ended up as Shigaraki. Also, from Mitsurugi we got the character tsurugi (‘sword’), so that formed a pair with tate (‘shield’). And finally, like you said, the name also comes from the tanuki (raccoon dog). 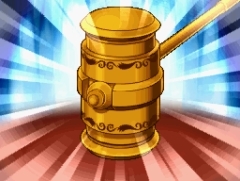 4gamer: It’s kinda apparant that Mikagami Hakari is a judge, but where did here name come from? Yamazaki: We had already decided on the hakari (‘scales’) part of her name. And because on the judge badge there’s one of the Three Sacred Treasures, the yata no kagami, we added kagami (‘mirror’) in her name. That we came up with the family name Mikagami, was because we choose a name with a good sound. 4Gamer: What about Ichiyanagi Yumihiko? Yamazaki: You can also read the name Ichiyanagi as ichiryū (‘first class’). And Yumihiko sounds like the name of a wealthy kid, but when you read his full name, you can read it as ichi ya naki yumi wo hiku (‘Using a bow without any arrows’), which basically means ‘a bow that can’t hit its target’. That’s why his deductions are always wrong in the game. 4Gamer: Aha, so that’s the meaning. And Ichiyanagi Bansai? Yamazaki: It’s just that: Ichiyanagi, Banzai! He loves himself (laugh). And he’s a very talented man, so he has ten-thousand (ban/man) talents (sai). 4Gamer: I can’t just keep on asking this, but I didn’t get this one: Sarushiro Sōta. Yamazaki: He’s a monkey tamer in the circus, and in the game, a monkey gets on his head and controls him, so that’s where his game comes from. (TN: Saru means ‘monkey’, shiro means ‘substitute’ and the given name is based on sōsa, which means ‘control’). 4Gamer: Is it easy to come up with names like these names? Yamazaki: It’s pretty hard actually (laugh). When I really can’t come up with one, I write the scenario with a placeholder name. I finallt gave Miwa Marie a name based on mimawari (‘patrol’), but during development I just couldn’t make up my mind on her name, and called her ‘Prison Director’ all the time. 4Gamer: Where does this sense of pun-based names come from? Yamazaki: Hmm, maybe it’s just in my case, but I think the fans of the Gyakuten series just expect these kinds of names. Eshiro: You just feel compelled to it (laugh). 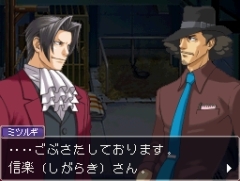 Yamazaki: At first, Mr. Takumi came up with these kinds of names for Gyakuten Saiban, because “many characters appear in mystery stories, so you need to give them characteristic, easy-to-remember names”. That somehow became a part of what made the series, and with every new game, it’s become harder and harder. 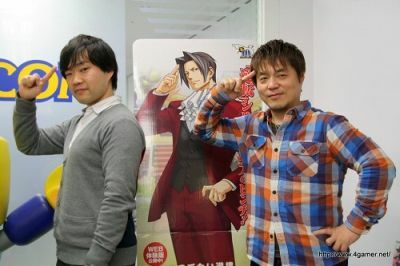 When we worked together on Gyakuten Saiban Yomigaeru Gyakuten (Ace Attorney (1) DS), he said: “Before I even knew it, everyone was expecting from me to come up with these names” (laugh). 4Gamer: Do you have any memorable stories about the characters? Eshiro: I had them do Ichiyanagi Yumihiko completely over. Originally, Mikagami had a gentle appearance, but I want to her look cooler and more like a rival, so had them the colors on her outfit, but Yumihiko’s design was changed completely. I don’t really comment on the characters usually, but Yumihiko was a very important character throughout the whole game, and I figured he’d appear in all kinds of media from now on, so I had them changed him completely. And seeing the result, I’m happy we changed him. 4Gamer: Was there resistance from the staff to the changes? Eshiro: A lot. Yamazaki came to me with “What’s wrong with him?!”. And I carefully explained it one by one to him. As I glared at him (laugh). Yamazaki: His explanation worked for me, and I do think the design changed for the better. I later talked with Mr. Iwamoto about this, and he too said: “I was angry at first, but now I think it was for the better” (laugh). 4Gamer: Are there any characters with special meaning to you? Yamazaki: To be honest, they all do mean something to me, but if I had to name one, I’d say Mikagami. She is in the important role of the rival, so whether it’s her name or design, everything was harder to decide. We couldn’t have her be to strange a character, but she did need to stand out. It was hard coming up with a way to make her look impressive and a tough opponent. And this is always a problem when coming up with a rival, but you need to have a completely new rival, with a story different from the previous rivals. So we came up with the completely opposite sense of toughness this time, with a female judge who takes on Mitsurugi’s attacks with a smile on her face. 4Gamer: I see, we had Karuma Mei (Franziska von Karma) as an aggressive woman before. Yamazaki: Now I look back, I remember it took us a lot of effort to finally arrive at Mikagami. 4Gamer: Any parts in particular that were difficult? 4Gamer: (laugh). By the way, what does she hit with her hammer? Eshiro: So her hammer is probably quite dirty (laugh). Yamazaki: I think Mikagaki wipes it clean every time she uses it (laugh). 4Gamer: By the way, did the two of you do the audition for voice actors for Gyakuten Kenji 2? Eshiro: They sneakily held the auditions while I was abroad for a business trip, so I couldn’t audition. If I had been there, I’d have become Bansai’s voice (laugh). Yamazaki: I did audition, but wasn’t chosen. They said my voice just wasn’t right. Eshiro: You don’t really have a voice that fits the characters. You need a really unique character, with a slightly high-pitched voice. Yamazaki: I could’ve done Yumihiko perhaps, but the person who was chosen had the perfect choice, so I guess it wasn’t to be (laugh). 4Gamer: By the way, do you need choose a character before auditioning? Yamazaki: For this game, we held a questionnaire among the team, asking “Who has a voice that fits a character?”. So we had that, and then listened to them and choose them if they fitted the character. 4Gamer: How many people auditioned? Yamazaki: About 15. Some were recommended by others, some came from other team. I’d suddenly call to them to the meeting room and ask them to yell “Objection!”, so I caused quite some trouble for those people (laiugh). Eshiro: And you had people do several takes even (laugh). Yamazaki: And then there was the actual recording, which also took several retakes (laugh). 4Gamer: Did Mr. Iwamoto, who did Mitsurugi’s voice, record new lines for this game? Eshiro: Yes. And if you listen carefully, you can even find other people with “Mr. Iwamoto’s current voice”. 4Gamer: By the way, for Gyakuten Kenji 2 you’re trying out something new, an audio drama. How did that happen? Eshiro: The audio drama came from the Special Court segments we have whenever the Gyakuten series goes to Tokyo Game Show. Originally, we didn’t use voices in the Gyakuten series so every user could imagine their own voices that fit their images. But in the Special Court segments is just one of the ideas of the development team I let them do as long as it doesn’t mean too much work. The audio drama consists of five parts, and we’ll be posting each part for a week on the official site. The concept of doing a CD with all of those parts sounded interesting, and the voice actors who played in the Special Court segment also had time in their schedules, so that’s how it happened. Yamazaki supervised the scenario, so I think it’s come out very nicely. Yamazaki: I was there when they recorded it and it was fun. But when Mitsurugi is explaining his deductions, there’s a lot of text then and it seemed quite difficult for the voice actor playing him. 4Gamer: Was there anything in particular you remember about the marketing campaign this time? Eshiro: There is Twitter first of all. We showed tweets that had to do with Gyakuten Kenji next to the demo on the website. We were divided about that idea in the company, because tweets with differing opinions from the people who played the game is quite risky as a marketing tool. But putting it on the scale we decided to do it, figuring that these are all real opinions from people, and while there might be negative opinions too. “Please try it out” was our idea. And I was so happy there were so many positive reactions, more than I had ever dared to dream. That’s when we started new projects with Twitter. Having the development team answering questions directly, or having Mitsurugi or Mikumo tweet, that was something we hadn’t done with the Gyakuten series before. Yamazaki: Twitter wasn’t that big when we released the first game. With a new medium like Twitter, we had some fun showing bits out of the everyday life of the Gyakuten characters, and we could directly answers questions from the fans, so it was really fun. 4Gamer: Was there a reason for trying these new kinds of approaches? Eshiro: We wanted to do something completely new. The collaboration event with E-Pin Kikaku was also something I thought might be fun ever since the previous game, and this time we made it happen. And for some reason, I too had to make an appearance. 4Gamer: You’re quite active (laugh). Eshiro: If you look at that, you’d go: “That producer really loves appearing on stage!”. And I’m dead too! (laugh). But it was an interesting experience. 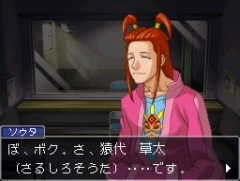 Yamazaki: I already knew the plot because I supervised the story, so I didn’t join in on the solving of the mystery. I watched from the guest seats, smiling as I looked at your fine acting (laugh). We had already talked about the collaboration with a Mystery Event before, like some sort of dream, but I’m really happy the dream came true. I’d love to do it again. 4Gamer: And there’s the usual collaboration with Pasela and Capcom titles. Eshiro: We have worked together since Gyakuten Kenji. We’ve got a nice team-up on the menu and the mystery quizzes. And last time, the song of Tonosaman was quite popular, it even ranked in. So we did the song again this time, and hid a hint to the quiz there. And we’ll be talking about this again later, but as a big project, we’re planning something new with the attraction in Tokyo Joypolis: Gyakuten Kenji in Joypolis. Their people are working with Capcom now and are really eager to bring Gyakuten Kenji alive in an even better way. I can’t give more concrete details now, but it’s planned for this spring, so look forward to it. 4Gamer: Would you be dying there again, or…? Eshiro: None of that. If I’d do that, I’d really be on stage too often (laugh). But I’d be happy if people would figure that if the producer is doing all these kinds of things, the game must be fun too, and they try it out. 4Gamer: As for other marketing campaigns, you had the “Readable Demo”, which was fun. It’s a traditional, but not often-seen method. Eshiro: That was an idea of the person overseeing the mobile contents. When we thought about how we’d have people on mobiles experience the Gyakuten Kenji series, we ended up with that. We also thought about other methods, like videos, but the Readable Demo was the form that was best to convey the actual contents of the game. At first, I thought that people wouldn’t get really excited just by reading, but from the data of the previous game, I knew that it could be very effective. So that’s why we did it again. And it is really well-done actually. Together with the mystery quizzes we update every week, it’s become a way to attract visitors to the official site. Yamazaki: It is a very good way to reach people who usually don’t play games. And the Gyakuten series is one that does appeal to that. 4Gamer: We already talked about this, but where do you draw the line about spoilers in the marketing campaign of an adventure game? Eshiro: About the information concerning the game, I always talk it over with the development team. I get all the details about what I can talk about, and what becomes a spoiler later on. And I talk with the people from publicity about what we announce at what timing. But what we try to do is to convey what makes the game fundamentally fun. For the Gyakuten Kenji series for example, that’s becoming and playing as Mitsurugi. So that’s why we come up with projects like the Mystery Event, and have everyone experience what it’s like to do a real investigation. That’s how we create hype. And of course collaboration events around the release date. 4Gamer: So you focused on having people experiencing that fun. Eshiro: Having people experience the fun, isn’t something started with Gyakuten Kenji 2. Marketing the game by having people experience it in different ways, is a way to let more people know about your game. There’s also the method of targeting the core fans and going in deep. But Gyakuten Kenji is not a complex title, so we wanted to reach out further. 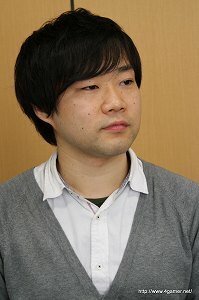 Yamazaki: It’s really effective to promote the games with projects outside the game itself, almost like a little party. You can have people get excited for the game, and you can also appeal to people who usually don’t play games. 4Gamer: Moving away from the game itself now, but I’d want to talk about the genre of adventure games. Even with games that are praised as masterpieces lately, the sales numbers don’t really manage to compare to other genres. The Gyakuten series is one of the few series which is well received and has good sales numbers. What’s the secret behind that? Eshiro: Definitely the unique world and the way we create our characters. As you just said, with Gyakuten Saiban 4 (Apollo Justice: Ace Attorney) and the Gyakuten series as mobile phone apps, we’ve been able to reach people who usually don’t play games, and the word-to-mouth communication also did wonders. So rather than that we aggressively try to promote our game, it’s like we make a good game that everyone who plays it talks about again. That’s been happening for ten years and now we’re here. We don’t use enormous amounts of money to promote the game in one or two years. It’s a series that has been raised to its current size by the users. Yamazaki: With adventure games, you enjoy a story as you read the text, but the Gyakuten series is slightly different. Gyakuten Saiban created the genre of “court battle”, so it’s really big on presenting a way to really “play the story”. The way you pursue the murderer: that is same the kind of exhilarating feeling you get when you’re fighting the final boss in an action game. The users aren’t just reading a story: we’re presenting them with a way to enjoy it unique to the medium of games, and that’s why it so well-received. This might not the reason why it sold well, but it is the reason why the games are fun. 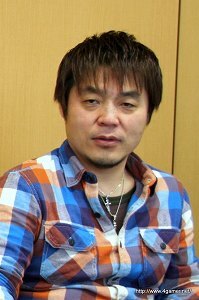 Eshiro: In the questionnaire we had for Gyakuten Kenji, we had the question “Would you play a sequel if one was released?” and a lot of people answered they would. I was really happy about that. If so many people are waiting for it, then we really need to surpass those expectations. Because of the economy, the market is becoming more difficult, so we can’t just fulfill expectations just by doing the exact same thing like the previous time. People will be critical about games that aren’t made well and see right through you and that would weaken the title’s strength. That’s why I always ask people to buy a copy to help the series, and support us by asking for sequels. 4Gamer: Could you tell us about the adventure games, or mystery games you’ve been playing lately? Yamazaki: I thought Danganronpa Kibō no Gakuen to Zetsubō no Kōkōsei (Danganronpa: Trigger Happy Havoc) was fun. It’s a challenging game that goes into a different direction than Gyakuten Saiban. From the story to the visuals and the graphics and presentation, it all screams “Let’s stand out!” As someone in the industry, I’m really happy a game like that was released. And a bit older, but Heavy Rain and Kyokugen Dasshutsu 9 Jikan 9 Nin 9 no Tobira (Nine Hours, Nine Persons, Nine Doors) were fantastic. Eshiro: I’m just a light user when it comes to mystery, but I like the TV dramas based on Higashino Keigo’s works, and always watch them. They are all about easy to understand themes for light users like me, such as “brotherly love”, “love between parent and child”, “falling in love.”I’m always thinking about if we can’t human drama like that working in the Gyakuten series. It’d be great if we could do that. 4Gamer: The Gyakuten series will be ten years old in October 2011. Could you tell us what you have planned for that? Eshiro: A lot is happening underground, but we can’t tell you about that yet. 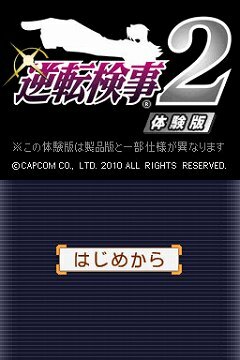 As the first project, there is the release of Gyakuten Kenji 2. I’ll be able to talk about the other projects planned after that. Also, we also have Layton Kyōju VS Gyakuten Saiban (Professor Layton VS Ace Attorney) planned, a team effort with Level-5. 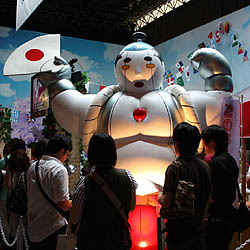 2011 doesn’t end with Gyakuten Kenji 2, so please keep a look out for news on Gyakuten series. 4Gamer: A final word for the readers please. Yamazaki: We worked hard on writing a story about Mitsurugi himself this time, so please watch out for that. And also watch out for the things that can only be done in Gyakuten Kenji, even within the complete Gyakuten series. We didn’t just stop with portraying Mitsurugi, but also challenged ourselves with the tricks and the mystery plot. Please play it. Eshiro: Gyakuten Kenji (1) went on sale about one year and nine months ago, and int the interviews, I said “I want to help raise this one so it can grow out into a series.” Because so many people enjoyed the game, we really managed to present the world Gyakuten Kenji 2. The development team’s effort to surpass those expectations was amazing and like Yamazaki said, we didn’t just work hard on the scenario, but we did our best on the volume of the game too. This is the best the team can offer you in the current system. For those still hesitating, if you try out the web demo, I think you’ll experience a sense of fun you’ll not have seen with other adventure games. If you liked the demo, I’d really be happy if you’d purchase the full game and play it out all the way to the end. 4Gamer: Thank you very much. LONG Interview. Absolutely worthy, nevertheless. It's nice to see they pay attention to players feedback. I like AAI1 but AAI2 it's simply better in almost every aspect. It's interesting that they acknowledge how difficult is to work in an universe not created by then. 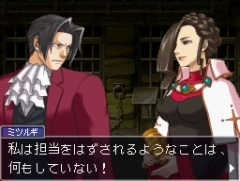 I think that they reach a good balance: AAI is definitely a spinoff but it's unquestionably an Ace Attorney game. Yes, I did like the first game, but the second game was a vast (and quite surprising) improvement. It was obvious that the team had a lot more confidence with their second title. If you read the GK1 interview I also have on the blog, you really see they thought it was quite difficult to invent a spin-off game, but that first game, with its fault, really paved the way for the much more impressive second game. Incorporating feedback is something the series has always done since the beginning. 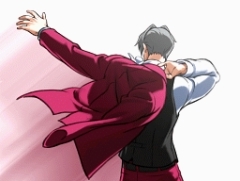 Fan feedback for Mitsurigi/Edgeworth resulted in a lot of changes for the second game for example (and the first game would not even have been *close* to the final product without the (harsh!) criticism/feedback on Takumi's original concept by everyone in the team). With this team, they seem to always mentiont it like some excuse (which is a bit of shame), but I think it does often work for the better, like also with the jump between AA5 to AA6.